Casual Black Button Up Shirt with White Stripe. Keep it neutral in this mens black button up shirt detailed with a diagonal white stripe. Black collared shirt features a slanted white stripe that runs into a white sleeve. 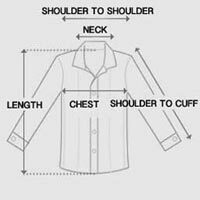 Standard collar tops a regular-fit silhouette with long sleeves and buttoned cuffs. Casual button-down shirt made from thin and breathable cotton blend with light stretch. When you need that essential going-out shirt, this black button up shirt for men looks so good dressed up or down. Model is wearing size M. Sizes are measured in inches. For accurate measurements, check the table below.